There's one more method of making flying geese that's fast, fun and super easy, but it does create more bulk and could therefore be a royal pain to hand-quilt. This method is often referred to as the one-seam method because it only requires one sewn seam to make. It's fun because the "goose" makes little pockets if not stitched down by quilting. I think children especially would have fun with a quilt made from these flying geese. I tried this method using 5" charms and found that two charms make two flying geese with an unfinished size of 2.5" x 4.5". As noted in the videos, one edge tends to come out a little wonky but it's easily trimmed. I usually press my seams to one side, but for this method pressing the seam open (for the two "sky" squares) seemed to make more sense. I'm excited to play with this method some more as soon as I get the instructions finished for the first block of the For the Birds BOM. It's taking longer than expected because I've forgotten my way around the software program I use. Use it or lose it, as the saying goes. All of the blocks in this BOM use flying geese units. 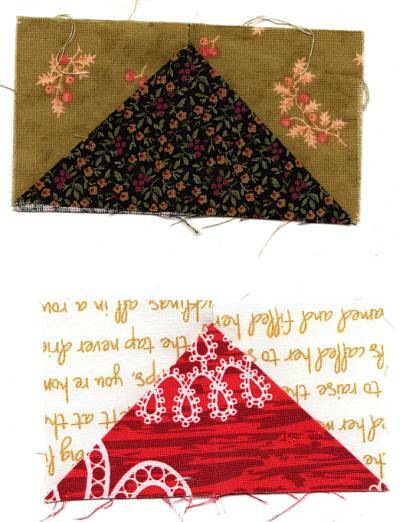 My block instructions show the method of making these one at a time, as this is generally the best method when using scraps. 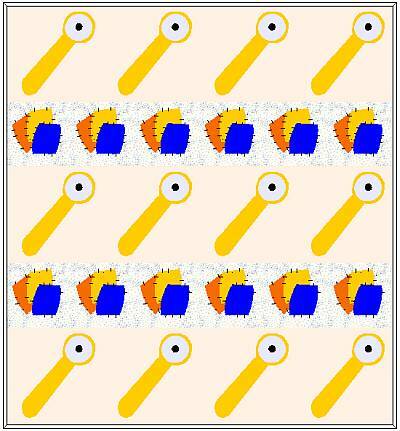 But there are several other methods for making multiple units. 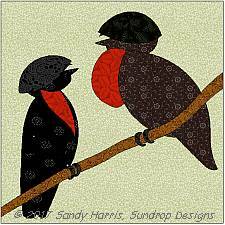 If you decide to use just two or three fabrics in your For the Birds project, you might like one of these methods better. 2. QuiltersCache also has instructions and formulas for three methods. There isn't a pdf but the web page prints nicely (on my printer, anyway) as two pages without excessive unnecessary web site stuff. 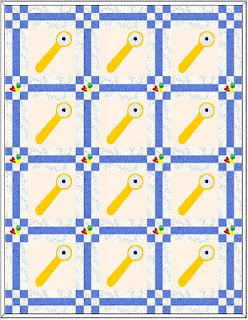 There's also a link on the page for printable paper piecing patterns in four sizes of flying geese. 4. Mary Hickey has an ingenious way of making multiple flying geese units using Seminole piecing techniques. Great for making borders, sashing or blocks that require lots of flying geese. 5. Here's another video that shows how to make 20 flying geese units using strip-piecing methods. Another great method when you need lots and lots of flying geese. I haven't tried these super-duper methods yet, but I will when the weather warms up enough for me to work in my sewing shed. Right now, I'm still working in my tiny winter sewing station - one corner of my kitchen table. It's time to start a new BOM! During the two years when nothing seemed to be going right with my health, I frequently found myself muttering, "This is for the birds!" After a while, my mind naturally started translating that common phrase into a quilt idea that I worked on now and then when I felt well enough to do something. The time has finally come to take it from paper to fabric! 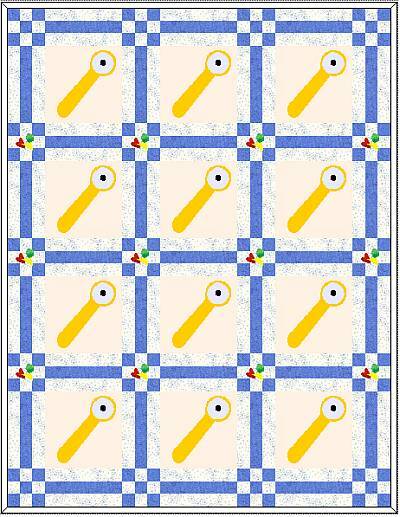 The patterns will include cutting measurements for 6" and 12" blocks for the pieced blocks, and the projects have different layout designs for each size. In the illustrations below, the rotary cutter represents pieced blocks and the fabric patches represent applique blocks. 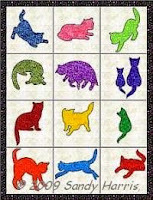 Both designs work well as 2 or 3 color quilts or as scrappy quilts with light and dark colors that contrast well. If making a 2-color quilt, choose a second dark for the medium. 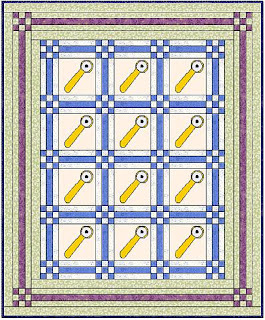 This design uses 12" pieced blocks with the appliques on 12 of the 6" cornerstones. The top, without borders,measures 60" x 98". I didn't include borders in the layouts above because there are so many ways to do them. 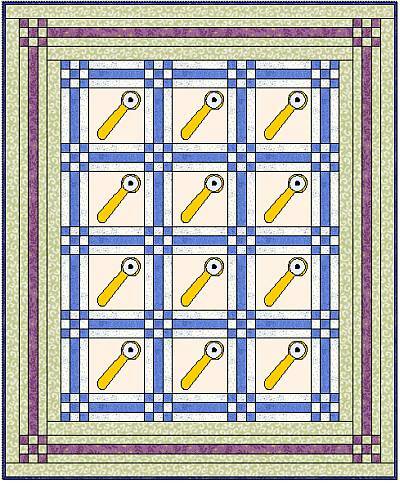 Below is one possibility for the twin quilt. I colored the borders green and purple to make it easier to get separate fabric requirements in EQ -- I would use colors consistent with the sashing in the actual quilt. Throughout the year, I will post other border ideas that are more scrap-friendly and therefore more economical. You might like one of them better. Or you can always create your own layout and border ideas. Let the creative juices flow!